I had one sit down dinner in Chicago with work colleagues during our welcome reception. Other than that, it was all casual eats that I enjoyed comfortably in my pj's in my hotel room while drinking a cold beer from my room's stock bar. 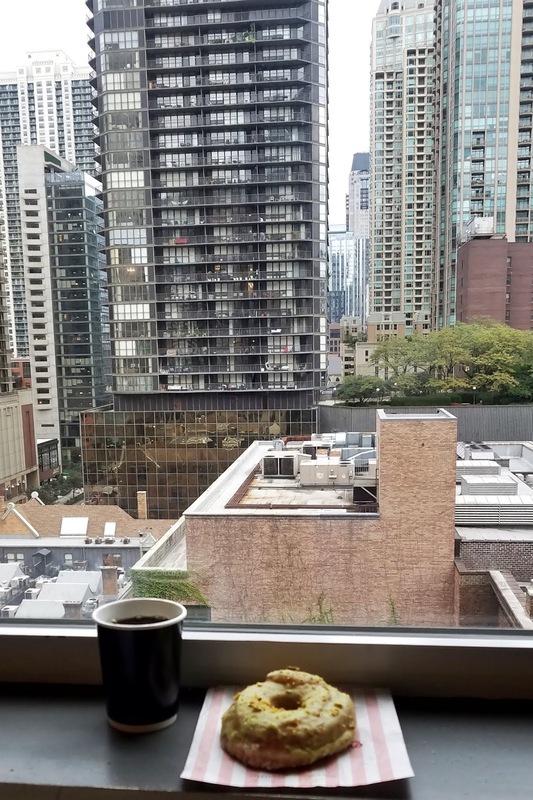 With an awesome view of the twinkling Chicago skyline at night outside my window, my Chicago hotel room had been the perfect solo dining venue. I also really do not eat much when I am by myself (which was why I was skinny before I met Mr Sweetie. Ha! Ha!) I will start with the eateries that I have actually tried. 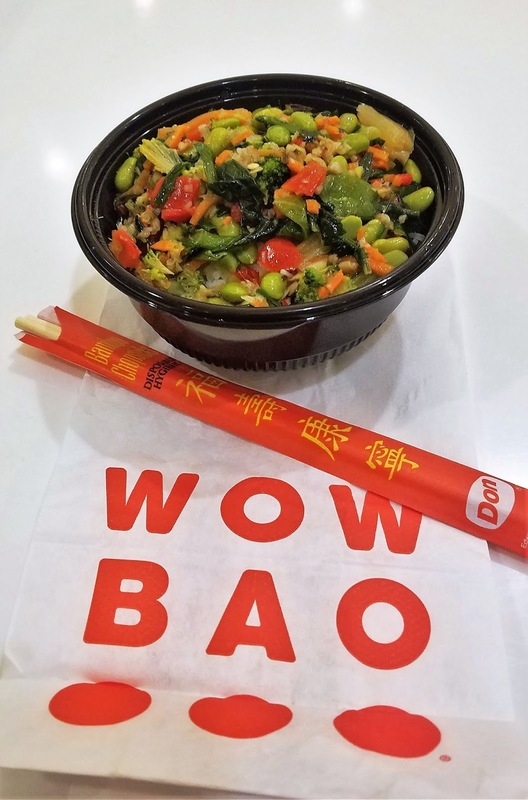 I will end this post with my Eats Wish List should I return to Chicago in the future, hopefully. I will start here as there are three "must eats" when in Chicago -- Chicago style hotdog, deep-dish pizza and steak. No on the last two because I am lactose intolerant and cannot eat dairy when I had an all day meeting to participate in and flight to catch. No on steak as because I am not a big carnivore at all. However, I like hot dogs. It is always a treat to eat a good hot dog. 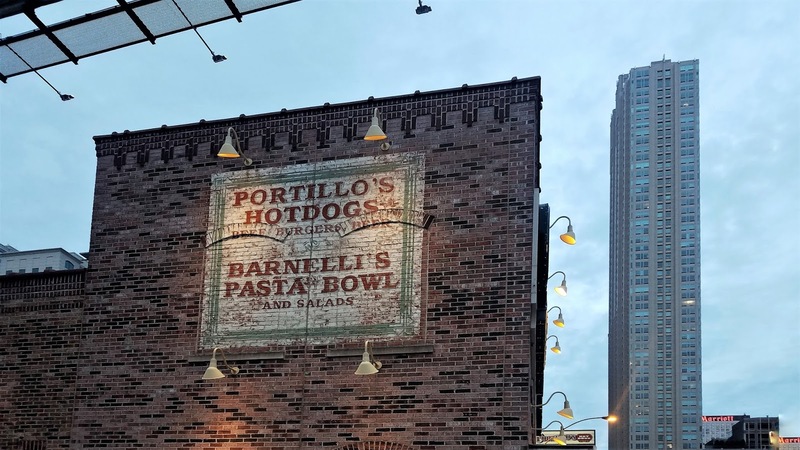 What I know about about Portillo's is that it has a deep Chicago history and that it keeps on popping up on the internet as the best place to get Chicago hot dog (or at least one of the best places). This was how I found out about Portillo's. On my last night in Chicago, I walked about 6 blocks from where I was staying. It was more on the backstreets of the River North neighborhood and away from the glitzy Magnicifent Mile. 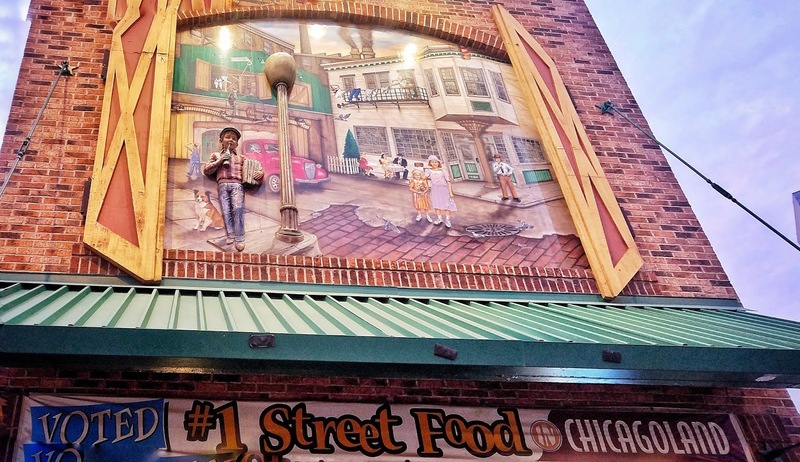 Portillo's itself is like a quirky food court/weird museum of Prohibition memorabilia. You can get Italian food, hamburger, etc. I lined up and got the Jumbo Hot Dog, I think, although it did not look jumbo. Maybe I got the regular. I was so cheap, though, like $4.75! I took it to my hotel room, ate it with potato chips. It was so perfect with an ice cold beer. It was great! My first taste of Chicago hot dog lived up to the hype. I could have eaten another one but it already hit the spot. 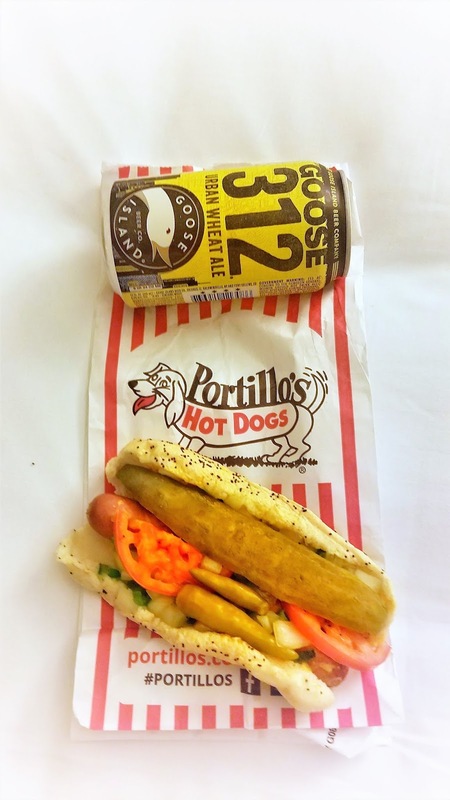 Portillo's is a fun and delicious place to get an authentic Chicago dog. 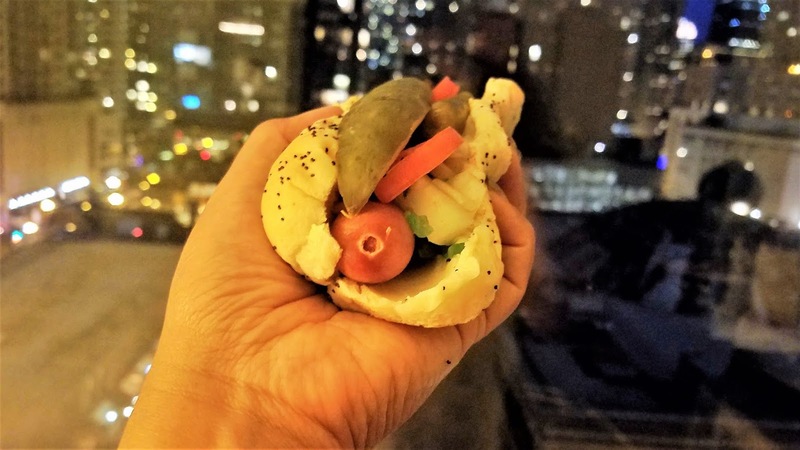 What is a Chicago hot dog by the way? This explains it here. 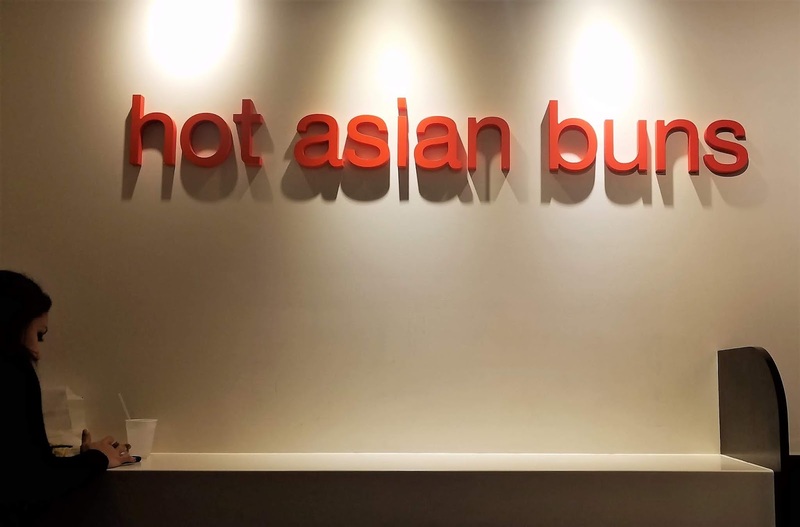 I ordered 4 buns: BBQ Berkshire Pork, Spicy Mongolian Beef, Whole Wheat Veggie and Curry Chicken. They were out of many of the items that evening. 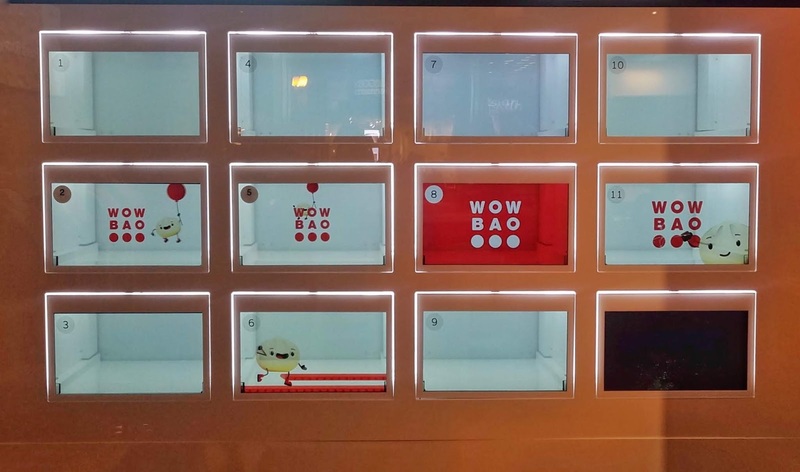 The bao's were yummy despite some reviewers complained that they were not authentic Asian. If I want authentic Chinese, I would go to SF Chinatown. They were good for what they were. $10 for 4 were actually cheap maybe because I am used to the uber-spendy Bay Area. I also ate here for lunch at another location the next day. I had something very simple this time, a veggie and rice plate. This time I ordered at the counter from a real person. It was fast, simple and healthy. This donut place was so pretty in pink that I had to go in. 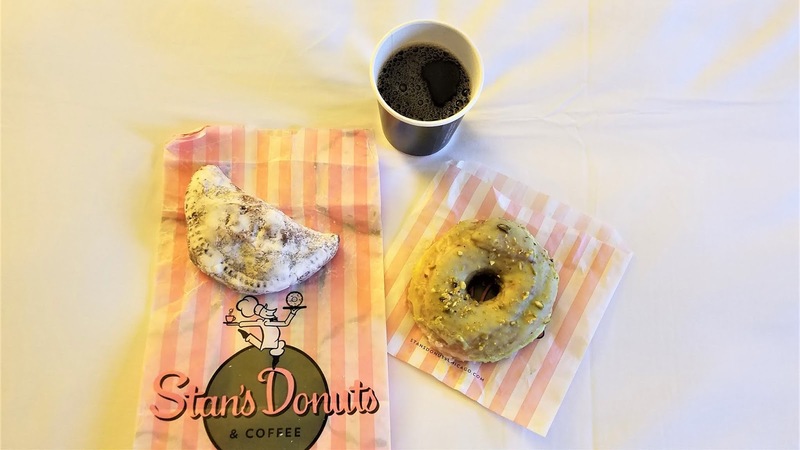 I later on found out that Stans Donuts are a chain in Illinois. I ordered the pistachio donut and nutella pie the first time. I had to go back and got apple cider donuts on my last night in Chicago. The donuts were yummy that I really considered bringing back a box home but then we have Dynamo Doughnuts in SF where I can get really yummy artisanal donuts as well. 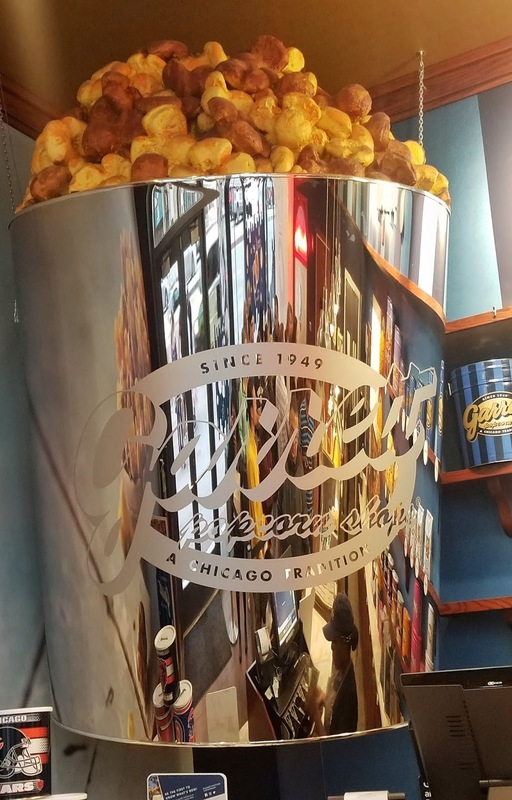 Garrett Popcorn is a Chicago tradition since 1949. I recognize this from watching the Travel Network. I got Mr Sweetie a bag. It was actually pretty pricey for a bag (I cannot remember how much but I remember thinking -- wow, a lot for a popcorn). It was so worth it because Mr Sweetie really enjoyed it. I turned out to be a perfect travel present for him along with an Al Capone mug and Fannie May Chocolates. Honestly, I would not have chosen a Mexican restaurant in Chicago since I am from the San Francisco Bay Area. 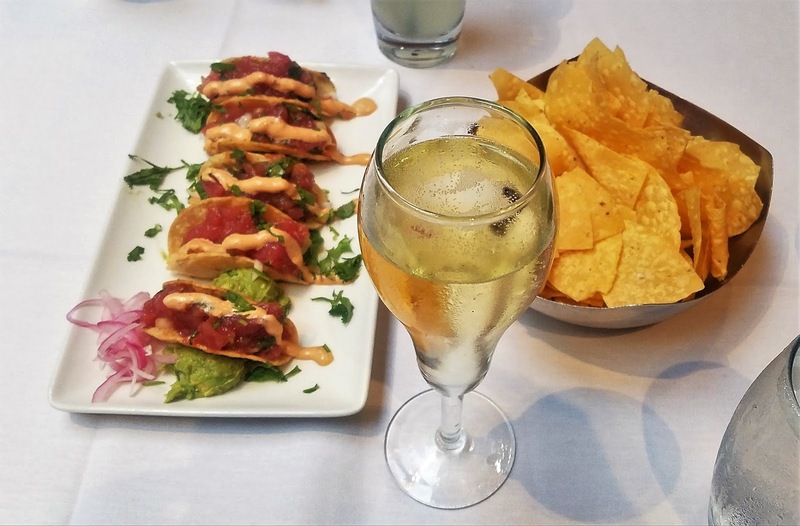 We have an awesome and authentic Mexican food scene here in the Bay Area. Cantina Laredo was where our hosts took us for our sit-down reception dinner. We were in a private room where we were treated generously to cocktails and wines that would not stop flowing, and a buffet-style dinner. Ambiance was classy and clubby. Dinner was intimate and delicious. I stuffed myself with the poke tacos and guacamole that were brought to our table. For mains, we had prawns, steak and grilled veggies that we could build into fajitas. We were also served a couple of mouthwatering desserts including tres leches. 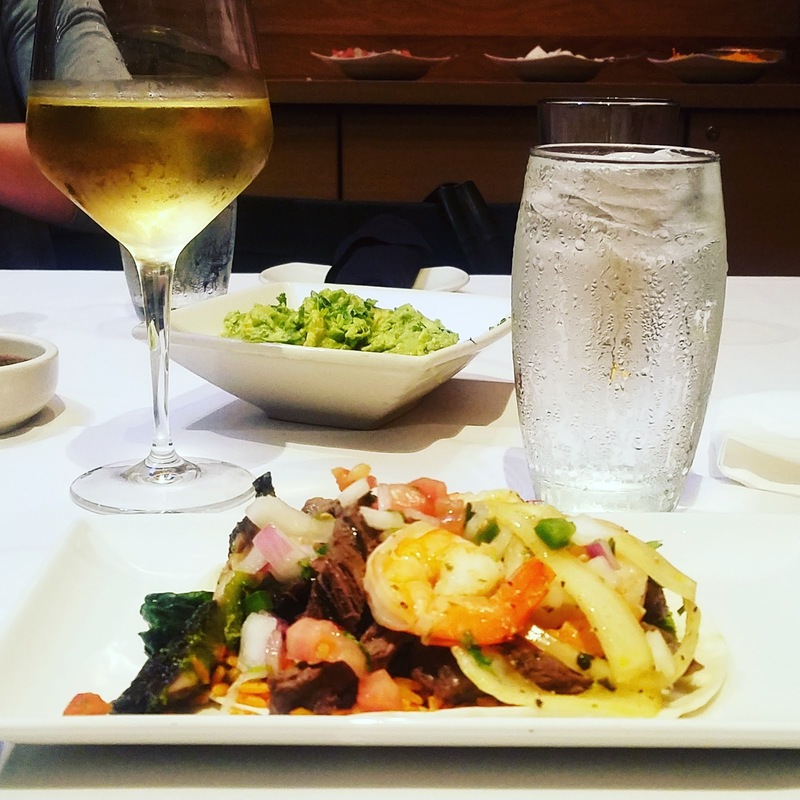 The dishes might not have been authentic but Cantina Laredo is a good option in this part of Chicago if you are craving Mexican food. I am very grateful for the generous dinner that our hosts have provided. Since I have been told that Chicago is known for its steaks, I thought that maybe Michael Jordan's Steak House will be a good place to have a fancy steak dinner with Mr Sweetie. I looked it up and the reviews on the internet seem promising. 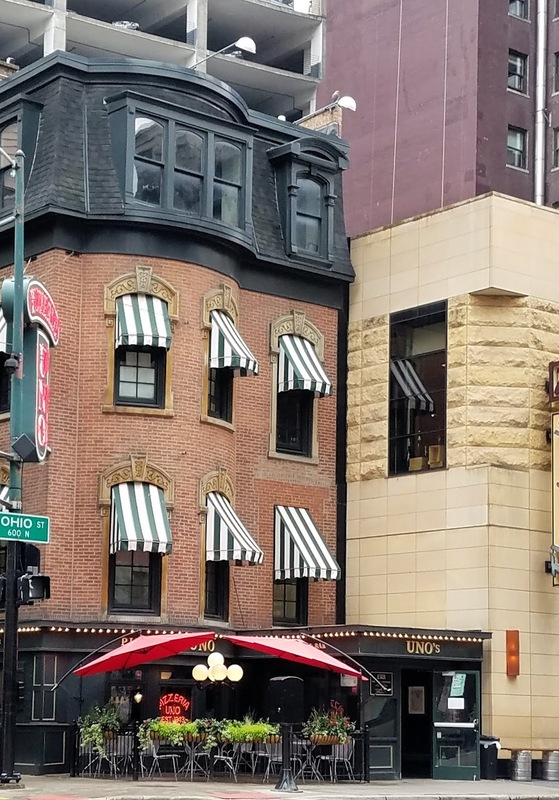 I had to include this place here because this is the birthplace of Chicago deep-dish pizza and it was around the corner from my hotel. Honestly, I had no desire to eat at Uno's since it can be found all over the world, most specifically at food courts. I admit though that it would have been cool to eat at the original place. I would go with Mr Sweetie. I like the location by the river. 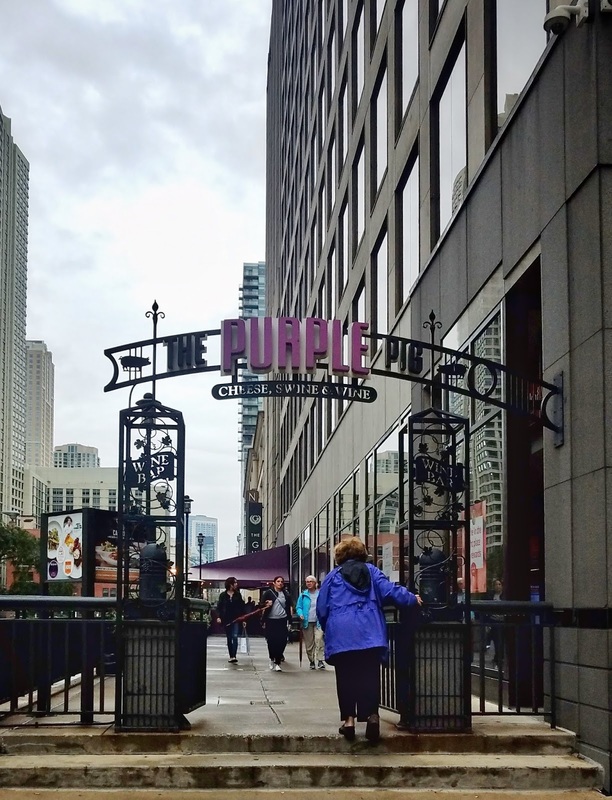 The Purple Pig serves tapas/Mediterranean cuisine. I saw Nando's on the Travel Network and it appealed to me. I walked by here and almost had dinner here but I did not have enough time during my trip. I really would like to try this South African restaurant that specializes in chicken on my next trip, God-willing. 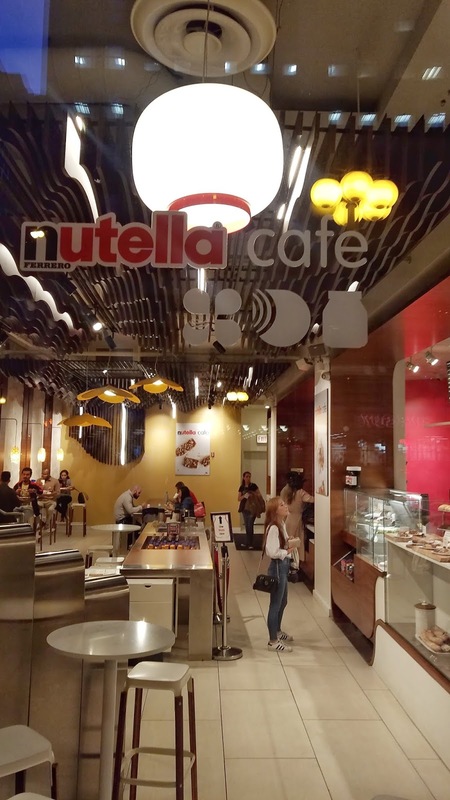 I walked by the Nutella Shop at the Magnificent Mile and it was a very attractive cafe. There was a fire place going. The decor was chic and contemporary. And as the name implies, the specialty is Nutella. 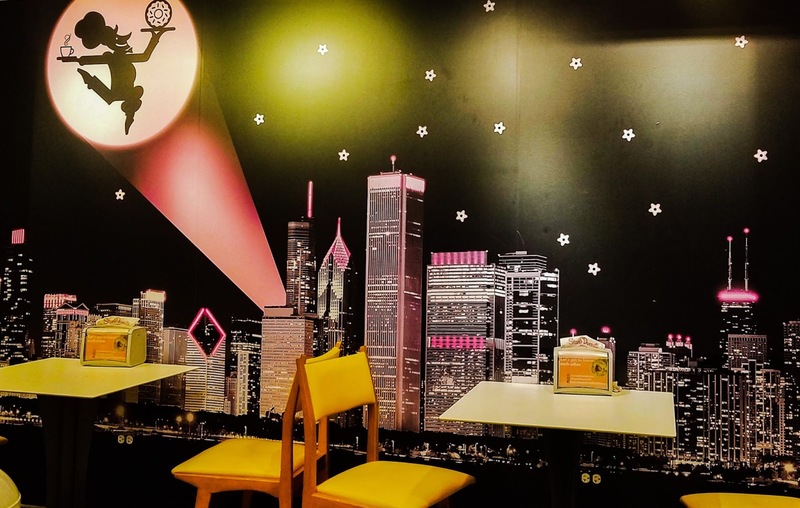 I was tempted to go in most especially after I found out that this was a very popular dessert destination in Chicago. It was empty on Thursday evening. Sure enough, on Saturday night, it was packed! I chose Stans Donuts right next to it instead of the Nutella Cafe firstly because I imagined everything to be sickly sweet and the reviews are pretty bad. If I had enough time in Chicago, I would have gone just for sh*ts and giggles. 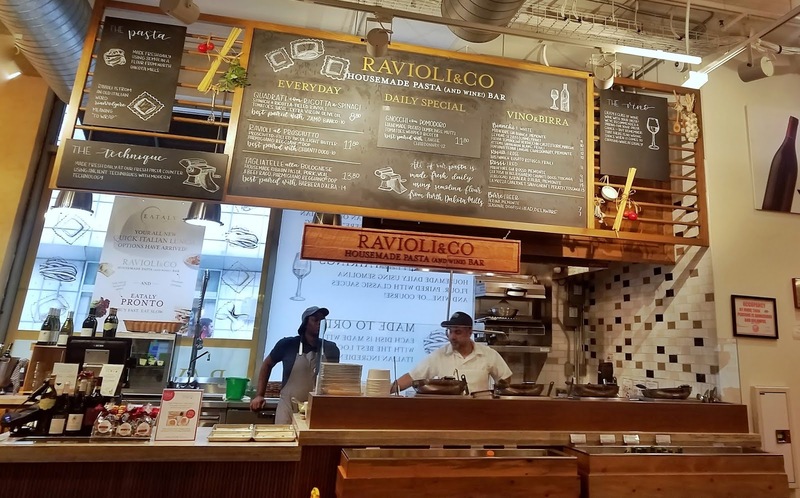 Eataly is an upscale "everything Italian" marketplace/restaurant. This seems to be the place to drink wine, have your dishes cooked as you are watching in a way that is casual yet elegant at the same time. It is a chain and can be found in the East Coast and Las Vegas. I walked in just to check it out but I prefer cute and authentic Italian shops than a big conglomerate one. 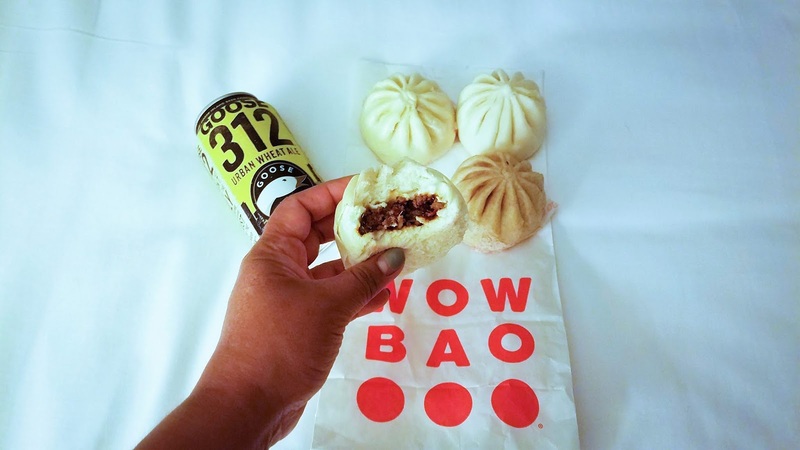 This is for a true foodie experience in Chicago. I am not a fan of famous places that require a lot of work to get a reservation. (This disqualifies me from being considered a foodie, thus, what I am is a "food lover.") Girl and The Goat has been highly recommended to me by my foodie friends. Maybe someday but not high on my list, really. I would have definitely gone to this champagne bar if I had the time. It would not have been good to come to my meeting hungover or board a flight later. I also wished that my girls where with me. Pops For Champagne would have been our place. It was just across the street from where I was staying.